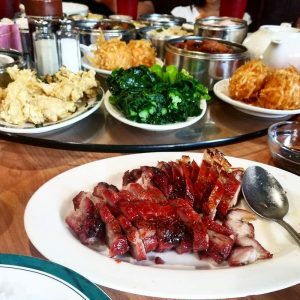 ***** DISH OF THE WEEK (Sunday- 12/23/18- Ming’s Bistro). The only thing that I can tell you guys…if this Chinese joint was within “striking distance” of Jeff Eats and Mrs. Jeff Eats’ Boca Raton abode, we would be real steady customers. ***** DISH OF THE WEEK (Sunday-9/17/17- Ming’s Bistro). Ming’s Bistro was real good in 2014…Jeff Eats and Mrs. Jeff Eats’ recent 2017 Ming’s Bistro dinner was off the chart delicious! Jeff Eats would be doing Ming’s Bistro a huge disservice by just singling out dishes like its bbq beef ribs ($12.95) or for that matter its sweet & sour chicken ($10.95) for special mention! Trust Jeff Eats when I tell you- this joint’s food absolutely kills! ***** Ming’s Bistro, 1212 Woodward Street, Orlando, Florida 32803, (407) 898-9672. Got a real-good Chinese joint for you guys…Ming’s Bistro in Orlando. Now, Jeff Eats maybe a bit presumptuous here-but I’m thinking… that if you like dim sum, or American Jewish Brooklyn Chinese Food circa 1957, or “real” Chinese food-you’re gonna enjoy Ming’s Bistro. Just so you know, Ming’s doesn’t have a website to check menu/prices, but trust me, its got a ton of stuff for you guys to eat–all at neighborhood Chinese joint prices. The joint does have the requisite no frills “décor”-lots of “red signage”- hanging roast pigs and ducks- oil cloth/tablecloths-waitresses who “make” like they don’t understand you, etc. A recent dinner outing had Jeff Eats, Mrs. Jeff Eats and another couple- “trying”- wonton soup, fried shrimp balls, baked bbq pork buns, roast pork fried rice, bbq pork ribs, beef chow fun, sweet & sour chicken, roast duck, fried sesame balls, seafood pan fried noodles, pepper steak, egg custard tart. Everything was right on the money! Ming’s Bistro is a real good joint to know about. Like it says at the “top” it’s in Orlando-so if you live in that neck of the woods- definitely give it a shot! For you folks from out of the area, the next time you’re doing Disney, Universal, Sea World–skip the chains and do this mom & pop. Ming’s is open 7 days a week 10:30am-9:30pm.